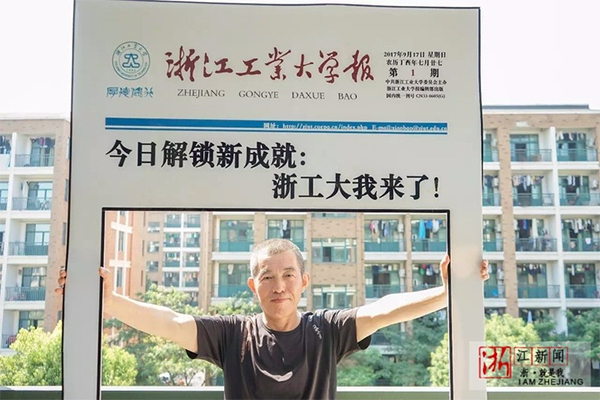 A 61-year-old man has become the oldest student enrolled this year at the Zhejiang University of Technology, reports Zhejiang Online. Zhu Hongshen is pursuing his master's degree in Law. Zhu earned his bachelor's degree as a young man, then went to work for the local government. He maintained his passion for study and decided to return to school after his retirement. "I will try my best to adapt to campus life," said Zhu, "I am getting along well with my young classmates." Dealing with legal issues through his work with his local government department, Zhu said it just makes sense for him to try to earn his Law degree. "It's challenging for people my age to memorize so many legal terms, but I will study hard," he added. Despite being a retiree, Zhu Hongshen is nowhere close to being the oldest college student in China this year. 83-year-old Liu Gongshi is currently enrolled at the Jiangsu Food and Medicine Vocational Institute, majoring traditional Chinese medicine, according to a report by youth.cn. A 61-year-old man has become the oldest student enrolled this year at the Zhejiang University of Technology.